eXpd8 Property software allows your firm to simplify the process of selling or letting properties. All data in relation to each property is saved in a logical manner that permits cross-referencing of potential buyers to potential homes. eXpd8 is designed to manage a new instruction from the moment a vendor calls to enquire about selling their house, right through to the close of the sale. It brings all the key information together into one place. eXpd8 Property software allows you to simplify the process of selling or letting properties. All data is saved in a logical manner that permits cross-referencing of potential buyers to potential homes. Our team are also committed to developing a GDPR compliant version of eXpd8 by the May 2018 deadline. Search by File Name or Account Code directly from eXpd8’s homepage. By typing in the first couple of letters into the search bar, the system will auto-select all files containing or beginning with those letters. The eXpd8 Scan Watcher allows you to allocate scanned items to their relevant files. Allowing you to view your post even when out of the office. Create alarms and alerts on a file to ensure that you never miss a key date or a deadline. One centralised address book used by everyone in the office, ensuring that everyone in the office has the latest contact details for all clients. eXpd8 has a comprehensive reporting function that provides you with options to create reports on File Creation Date, Files by Owners , Categories or File Status. One central area accessed by all users ensures only the latest version of standard templates are used. Everything you do within eXpd8 has an associated time and therefore a cost. Record your time against each activity and ensure that you never miss a billable second. 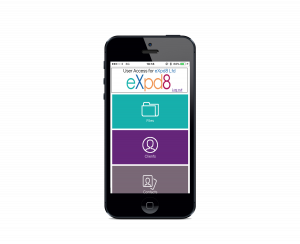 The eXpd8 mobile app gives you access to all your firm’s information from wherever you take your mobile device. At the push of a button, you can view your files, contacts, scanned documents, phone messages, and alarms while on the go, allowing you to connect to your office no matter where you are. Depending on your firms set up and needs eXpd8 can allow you to keep your data on your own personal server or move to the eXpd8 cloud where your data is stored in Microsoft Certified data centres providing you with enterprise-level security. Our team of technical specialist can help you determine the most suitable option for you and your firm.